You already know that when air moves, it is called wind. Air moves from the region where the air pressure is high to the region where the pressure is low. The greater the difference in pressure, the faster the air moves. But how is the pressure differences created in nature? Is the difference in temperature involved? The following activities will help you to understand this. The pressure exerted by air on all bodies at all times in all directions is called air pressure. When air moves at high speeds, it creates a low pressure area. The air inside a balloon exerts pressure in all directions, and makes it blow up. Air opposes the motion of a moving object. This is called air resistance. That is why you have to exert yourself and pedal hard when you ride a bicycle. 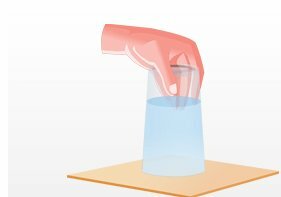 Another example in which air pressure can be observed: Take a glass and fill only 1/3 of it with water. Cover the mouth of the glass with an index card. Now hold the card in place and invert the glass over a sink and remove your hand from the card. The card sticks to the glass. This is due to air pressure. The air outside exerts an upward pressure on the index card. This air pressure is more than the weight of the water in the glass. Take a tin can with a lid. Fill it approximately half with water. Heat the can on a candle flame till the water boils. Let the water boil for a few minutes. Blow out the candle. Immediately put the lid tightly on the can. Be careful in handling the hot can. Put the can carefully in a shallow metallic vessel or a washbasin. Pour fresh water over the can. What happens to the shape of the can? Can you guess why the shape of the can gets distorted? If you cannot get a tin can, take a soft plastic bottle. Fill it with hot water. Empty the bottle and immediately cap it tightly. Place the bottle under running water. When you fly a kite, does the wind coming from your back help? If you are in a boat, is it easier to row it if there is wind coming from behind you? If you are in a boat, is it easier to row it if there is wind coming from behind you? Do you find it difficult to ride a bicycle against the direction of the wind? You know that we have to fill air into the bicycle tube to keep it tight. Also, you know that a bicycle tube overfilled with air may burst. What is the air doing inside the tube? Discuss with your friends how the air in the bicycle tube keeps it in shape. All these experiences show that the air exerts pressure. It is due to t his pressure that the leaves of trees, banners, or flags flutter when the wind is blowing. You can list some more experiences which show that the air has pressure. Let us now try to explain why the can (or the bottle) gets distorted. 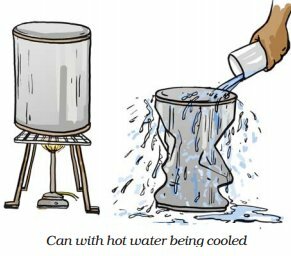 As water is poured over the can, some steam in the can condenses into water, reducing the amount of air inside. The pressure of air inside the can decreases than the pressure exerted by the air from outside the can. As a result the can gets compressed. This activity again confirms that air exerts pressure. Winds are caused by variations in air pressure. A wind blows from a region of high pressure to a region of low pressure. The speed of the wind mainly depends on the difference between the pressures of the air in the two regions. High speed winds are known to blow away thatched and tiled roofs in rural and semi-urban areas. Strong winds can uproot trees and electric poles, and even snap cables. Crumple a small piece of paper into a ball of size smaller than the mouth of an empty bottle. Hold the empty bottle on its side and place the paper ball just inside its mouth. Now try to blow on the ball to force it into the bottle. Try the activity with bottles of different sizes. Challenge your friends if they can force the paper ball in by blowing into the bottle. Paheli and Boojho are thinking about the following question: Why is it difficult to force the paper ball into the bottle? Blow the balloons: Take two balloons of approximately equal size. Put a little water into the balloons. Blow up both the balloons and tie each one to a string. Hang the balloons 8–10 cm apart on a cycle spoke or a stick. Blow in the space between the balloons. Try different ways of blowing on the balloons to see what happens. Can you blow and lift? Hold a strip of paper, 20 cm long and 3 cm wide, between your thumb and forefinger, now blow over the paper. Paheli thinks that the strip will be lifted up. Boojho thinks that the strip will bend down. What do you think will happen to the paper? Were the observations along the lines you thought? Do you get the feeling that the increased wind speed is accompanied by a reduced air pressure? When we blow into the mouth of the bottle, the air near the mouth has higher speed. This decreases the pressure there. The air pressure inside the bottle is higher than near the mouth. The air inside the bottle pushes the ball out. In Activity 2 when you blew between the balloons, they moved towards each other. How could this happen? This could happen i f the pressure of air between the balloons were somehow reduced. The pressure outside the balloons would then push them towards each other. In Activity 3 you saw that when you blew over the paper strip, it went upwards. Again, this could happen if blowing over the paper reduced the air pressure above the strip. We see that the increased wind speed is, indeed, accompanied by a reduced air pressure. Can you imagine what would happen if high-speed winds blew over the roofs of buildings? If the roofs were weak, they could be lifted and blown away. If you have any such experience, share it with your friends. Let us try to understand how winds are produced, how they bring rain and how they can be destructive sometimes. We have learnt that all storms are low pressure systems. Wind speed plays an important role in the formation of storms. It is, therefore, important to measure the wind speed. The instrument that measures the wind speed is called an anemometer. It is usually fixed on the top of a building. Air around us exerts pressure. Air expands on heating and contracts on cooling. Warm air rises up, whereas comparatively cooler air tends to sink towards the earth’s surface. As warm air rises, air pressure at that place is reduced and the cooler air moves to that place. The moving air is called wind. Uneven heating on the earth is the main cause of wind movements. Winds carrying water vapour bring rain. High-speed winds and air pressure difference can cause cyclones.